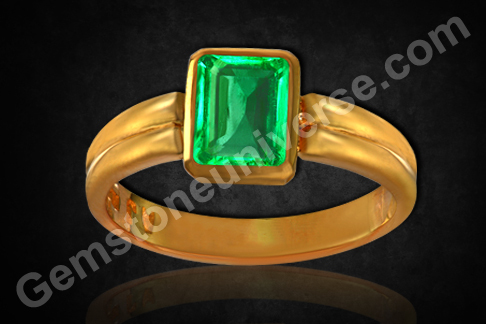 Zambian Emerald | Emerald Color | Beauty of the Gem | Emerald Cut | Untreated Emerald. Packed with the saatvik energies of Budha/ Mercury, this gem is a blessing for traders, sales and marketting people and those that rely greatly on the gift of gab for their livelihood. This zambian emerald has the coveted deep rich emerald green color. 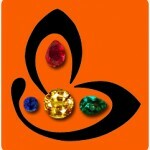 The beauty of the gem is enhanced due to the step cut which is known widely as the emerald cut. It wouldn’t be wrong to wonder on the reader’s part – that if the gem itself is an emerald, why is there a description like emerald cut or emerald color being tagged here! Wouldn’t all emeralds be qualifying for this description? The step cut is the most preffered cut for emerald for it is a fairly brittle gem – rates only 3 on the moh scale. The step cut gives this gem more stability and staying power in a setting. Since a majority of emeralds are found to be fashioned in such a manner, the name that does rounds and is accepted widely for this cut is the classic emerald cut. Other gems can also be fashioned in the likeness of the classic emerald cut. Emerald color is also a very specific vivid green color with certain saturation and with the ever so slightest hint of blue – gives the shade but is imperceptible to the eye as a distinct hue! Complicated eh? That’s what makes the color grading of gems decades to master! You, dear patron just sit back and enjoy the lovely! Thank you dear patron for the gracious testimonial!